See more objects with the color darkslategrey dimgrey grey or see all the colors for this object. This is a Poster. It is dated 1988 and we acquired it in 2009. Its medium is photo-offset lithograph on paper. It is a part of the Drawings, Prints, and Graphic Design department. The Guerrilla Girls, founded in 1985, are a group of anonymous female graphic designers who combine substantive content with eye-catching graphics to present feminist viewpoints in a sly, ironic way. 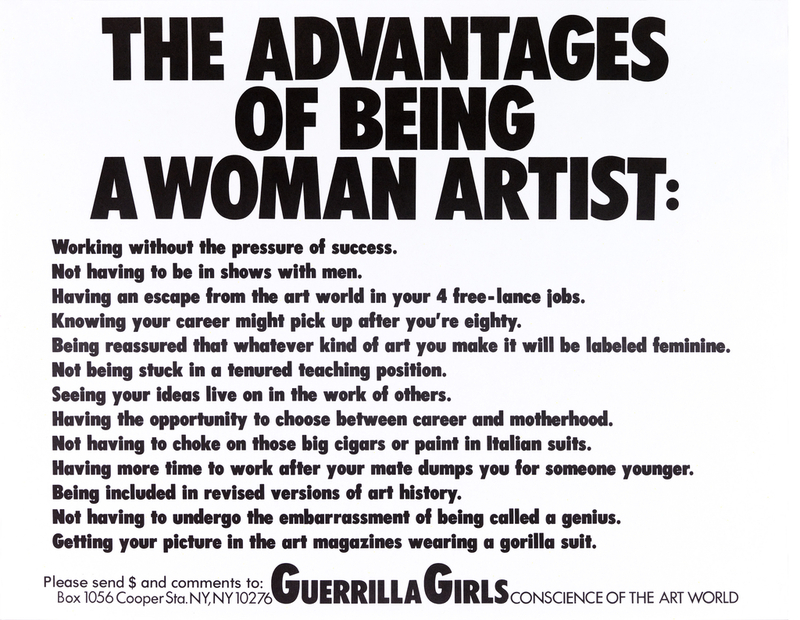 The Advantages of Being a Woman Artist is proposed for acquisition along with another Guerrilla Girls poster; the pair would be the first posters by this design group to enter the collection.